I write on technology almost every day. I consume a lot of data and there are so many times when I can’t do it on a daily basis. In weekends or if I am on a vacation and I have no way of accessing the internet, I tend to get behind on this. Most of the time, I resume with the current news rather than looking at what happened on these past few days. Only a few news are worthy of being read and those too because they are going to be happening in the future rather than something that already has happened. My point here is that these days, news gets old quite quickly and with internet becoming a more integral part of Indian youth, where does that leave the technology magazines. In fact, where does it leave magazines in general? The content today is mostly available on internet and while I will be speaking with technology on mind it might as well be applicable on every kind of magazine. Now, I am not saying a hard copy of magazine. I am saying the prime need itself might not exist anymore. I have been buying a tech magazine since I was in school but now either I find the information old or redundant. The softwares are mostly the ones I have easily installed from the internet or they are trial versions which mostly will need internet to buy and download the full version. The only places where these magazines are currently of use are those where there are no internet connections present (small cities) or where people might be apprehensive to go to cyber cafes. Other than that even economically it is better to get a 100 Rs. GPRS connection and use it to browse information rather than buy a magazine. The only thing that right now sustains a magazine is nostalgia and habit. I get it because I have been getting it for years now and even when I skip a month or so, I do not miss it as I also follow the magazine’s blog thus have actually read the article that will come in the magazine. As new generation takes over, these companies will have to come up with either a new way of enticing customers or a new product to sell. Remember- Nintendo was a playing cards company in the beginning. Adaption happens all the time in market. What is your opinion? Do you think Magazines have much life left or are they already obsolete? @Altaf: While these places do hold potential as of now, many of such places have small TVs as well now. Also, these places mostly have pirated or old magazines which do not have any direct revenue impact on the actual publisher. @Darode: You are absolutely right. 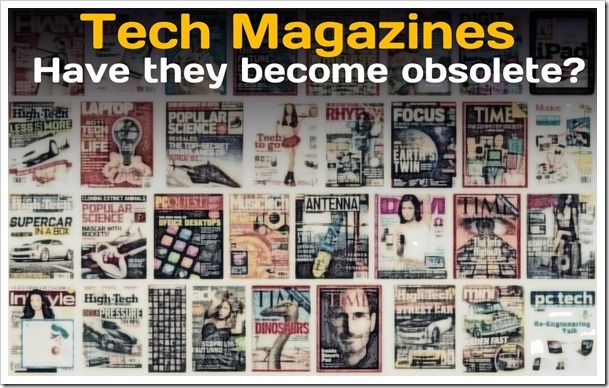 I just chose tech magazines as an example to show what is happening to the whole industry. Tech because, I am close to it. Why single out Tech Mags alone? The entire print industry is in deep red. Many illustrious mags have closed their doors and many are on their way out. Another funny place which I can think of where hard copy magazines are not only found but are necessary is in an unlikely place.